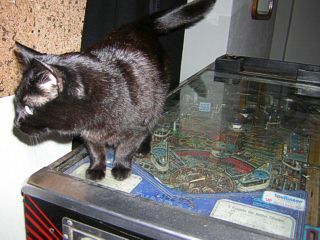 Back in summer 2004, I started searching for a classic pinball game. I did this after looking through the list of machines that Bally and Williams produced from 1980 to 1999. I wanted to find out which games I could be interested in and found some classics from the 80s which surprised me since I'm actually more interested in complex games where you have a lot to do and where the machine keeps you busy for weeks or months. 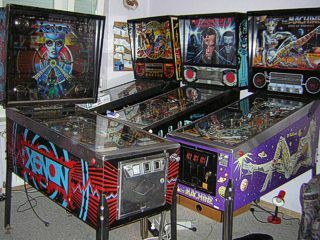 Still, as I described in several other articles, some classic machines have themes or designs that simply take my heart by storm, especially the space pins like Firepower (I'd love to try this one out), Space Shuttle (gotta have that one soon) and also Space Station, which I had but dismissed for weak gameplay. As you know if you read the other articles, I've been searching for "the" pinball classic for quite a while, but I gave it up with Pin*Bot which was a good game but too modern to feel old school, and it was the time when I started playing more and more DMD games in other locations, so I started getting more interested in those, bought my T2 and later exchanged Pin*Bot with Black Knight 2000. My conclusion was: maybe the classics I really want to have (namely Space Shuttle and Xenon) are the only ones from that era which work with me, and all other machines need to be 1989 and later. By now I don't think this is accurate anymore since there are System 11 games that I like, for example Whirlwind (never played it in reality though), Pin*Bot (I liked it even though it became boring) and Space Station - yes, the game is great in a way and maybe I will get it back some time in the future when I've got five or six machines already and another "not that good but still nice" game will not hurt. I think the problem with all these classic games is that they cannot stand on their own in my room and that's why I needed three other, more complex games first. But then I also had tried these classics already and didn't want them back, so what next? Could it be anything next at all, seeing how full my room was with three machines? This winter I decided that yes, it could be, and it should be a classic I never had before, and this time one of the really old games with the full character. I decided to get Xenon. 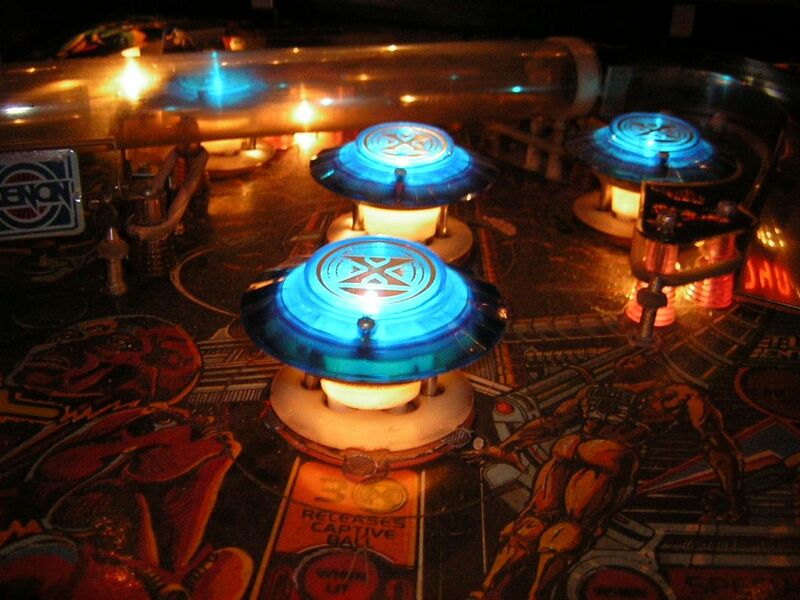 I posted in the Pinball Network forum that I was looking for a Xenon, but nobody responded. 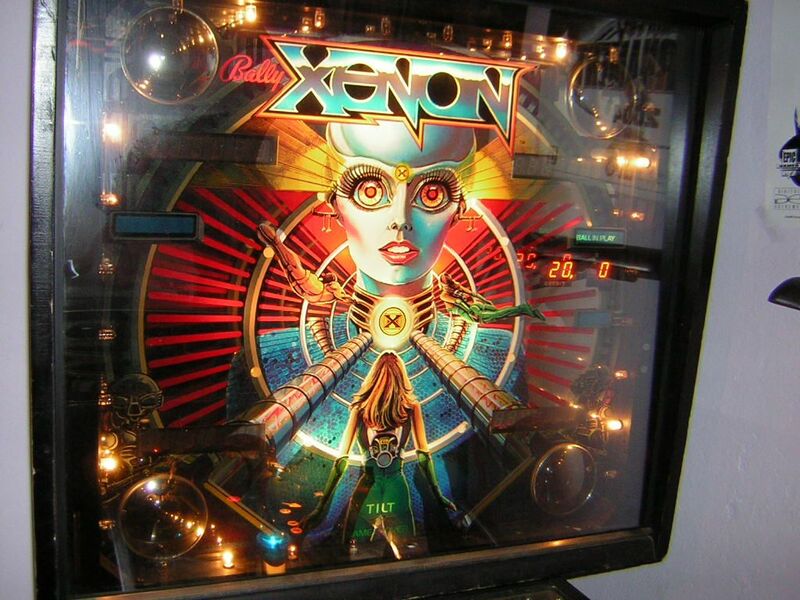 After all, while there were 11,000 units produced, Xenon is a sought-after game because many of the old pieces are garbage today and the remaining models are collectors' items. 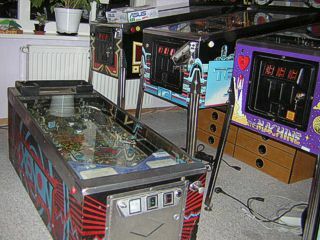 I got a hint from Hobbykoch that a specialist in Berlin was putting up his Xenon for sale and it was all made, with a touched-up and clear-coated playfield, new parts, tumbled metal, all new rubbers and lamps and whatnot. The photos looked awesome, but the price tag was way too high for my taste as Xenon is a simple game no matter how good it looks and spending 600 bucks for a simple game is beyond me. Of course I saw that the price was justified given all the hard work that was put in it and the cult status and rarity - still, my aim was to find a Xenon which needed work I could do myself. This way, it would be cheaper, it would keep me busy beyond the simple gameplay (it becomes boring game-wise but is an adventure when I start working on it, giving me back the pinball atmosphere) and it would become "my" Xenon once I'd be done. I found such a game when somebody posted that he had a Xenon for sale or rather exchange against a Flash Gordon machine, but since nobody offered one, I told him that I absolutely wanted his Xenon for cash and he saw what I meant and agreed. A few phone calls and private messages later, the deal was set and two weeks later I had trans-ferred 300 Euros to his bank account. Now came the adventure with the shipping company. I used the same that shipped Black Knight 2000 to me because many pinball fans recommend this company and they don't cost much, plus they are one of the rare enterprises which still do ship pinball machines at all. However, when I called and later wrote the order via e-mail, I had a feeling that this time it could be as troublesome as it was with BK2000 last year, when first they needed more days than planned to get it here and then they forgot to call me to tell me the delivery day and time. Guess what happened with Xenon? Right, they forgot to call me, so on Thursday I called the woman who was my contact per-son for this order, and she called me back on Friday while I was at work, telling me the machine was in Berlin and their partner company was ordered to call me for delivery time. Well, I did get a call from them, but they said that the driver stood in front of my house and wondered why nobody was there. Realizing that they had messed it up, I quickly ran home from work to meet the driver, unpack the two parts (cabinet and backbox as single parts) on the street to carry it inside, pay the driver a tip for his work and waiting, and rush back to work. Once the evening came, I rode home again to greet my new baby. Since we unpacked the game in a hurry on the street, I had the two parts in the flat when I came home. Why was the backbox dis-attached? 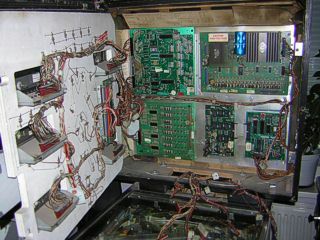 Well, the old Bally games didn't have a junction between backbox and cabinet to fold down the backbox for transportation, so the two parts had to be separated and packaged as one. Now I had to get both parts into my room and put them together, but first the room had to be completely redesigned so Xenon as the fourth machine would even fit in! 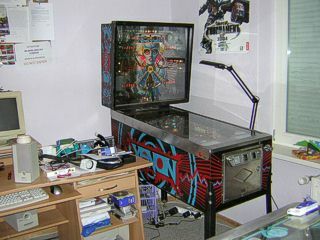 As described in the "My Room" section, my friend Patrick and I moved the other machines and furniture to make space, then moved Xenon into the room where we assembled the cabinet, legs and backbox. We noticed that at least the backbox seemed to be a lot heavier than those of Williams games, and the cabinet didn't feel very light without the backbox attached either (where a pure cabinet does feel lighter with Williams games). Plus, when we attached the backbox, we had to cope with a lot of dirt as well as the fact that the swing-out door kept opening because the lock was gone and the door itself was worn out and needed a good five centimeters uplifting before it closed. To cut it short, it was a shitload of work to put Xenon together and move it into the edge, but it did work out by midnight and the game booted up. First we wondered why none of the solenoids worked, but then we found out that the tilt mechanism had blocked the solenoids and we got it working and up for a test game. Xenon was the first pinball game with a female voice. This voice and all the sound effects were created by electronic musician Suzanne Ciani who was externally hired by Bally for this job. 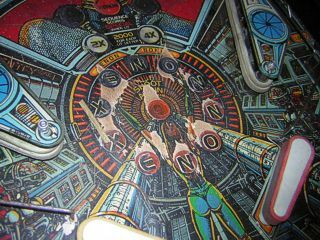 Xenon is famous for its theme and game-play, but the connection between Xenon and Ciani is what fans pay most attention to. You can find various Suzanne Ciani fan sites with a separate chapter for her work on Xenon and vice versa. A short television documentary filmed in her studio and at Bally Manufacturing has made the round to every fan by now although the version you can commonly find on the Internet has very low picture quality and is from a Dutch TV source (actually the documen-tary was American, but the only recording on the web is the Dutch version). What this means is that the narration is Dutch, however Ciani's interview snippets are raw English (without subtitles; the Netherlands must be very friendly towards the English language?) and there is also a translation for the narration available on the websites which offer the video for download. Since I am hosting the original AVI video on my webspace whereas most other sites only have the even-lower-quality QuickTime version, I have also included the (slightly edited for spelling) translation in the "Media" section of this article. The video shows how Ciani created the sound effects, music and voice samples (using her own voice) with a lot of analogue equipment which is very interesting to look at, compared to how music is made today. The focus of the video's narration is explaining the then-new Vocalizer chips Bally built into Xenon. Those chips were superior to previous ones since they could store more units of information and therefore could contain female voice samples. This means that Xenon wasn't advanced only thematically and design-wise, but also technically. Of course this advantage and modern image is lost today since the game is an ancient classic by now, but you can see how modern it once used to be if you compare it to machines of the same year. 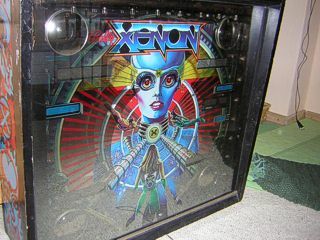 Xenon's theme is not only conveyed through images and sound, but also the lighting: the backbox features two glasses; one being the normal fine-printed backglass (which hasn't lost any paint in 24 years on my machine) and the second set before the actual backglass to cover it from the front. But this glass actually has a transparent mirror layer in certain areas which is used for an infinity effect: a frame of lights built between the backglass and the mirror cover glass runs around and speeds up with the music as your game pro-gresses, and the lit lamps are double-mirrored in the two glasses so that you see an infinite "tunnel" of lights. As far as I know, this effect was only used on one other machine (Vector) and then discarded, which is quite sad since it's a real eyecatcher the first time you see it. The lighting specialty continues when you look at the playfield: bumper caps are completely custom and have blue colour instead of the usual red or white, giving the lamps under them a smooth, cold and futuristic look. 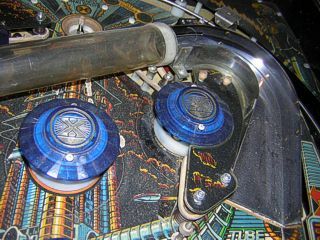 Futuristic, that's what Bally had in mind for Xenon's lighting when blue inserts and star posts were added to the playfield which was indeed new at the time - and still today you don't usually see blue inserts on other pinball games! Xenon's gameplay is simple, but that's expected for a machine from 1980. It does keep you busy for some time though and can be a great time killer if you've got nothing to do and just want to play for points instead of the big adventures you get on modern machines. As I said above, I'd never want such a simple game as the first, second or even third machine and that's why I kept away from it till now. 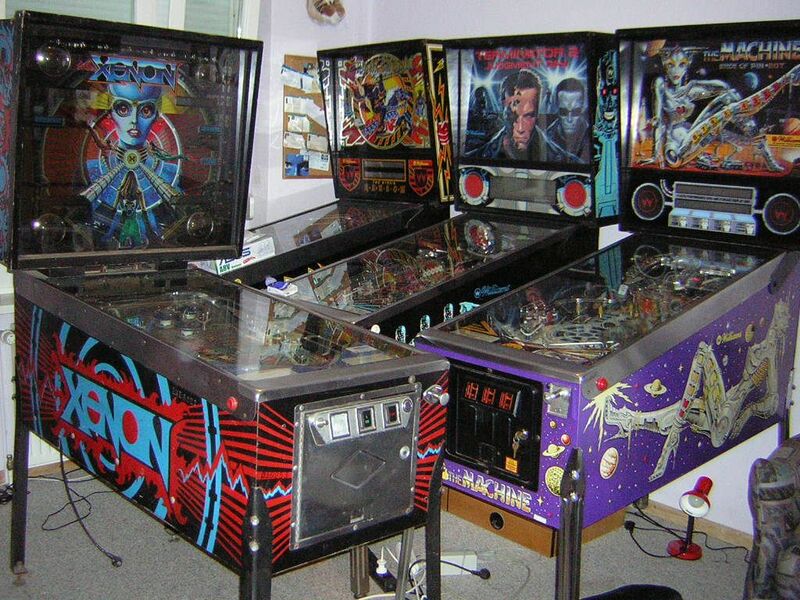 But if you want to add classic value to your collection and see what pinball used to be in the "good old days", Xenon's gameplay does give you that. 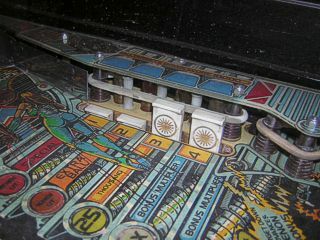 The playfield is very bare with the usual drop target bank at the right, typical shooter lane, four rather unusually placed bum-pers, two kick-out holes, two standup targets for bonus advancing, a spinner and the "tube shot" which is basically a shallow ramp with a hard edge and a plastic tube the ball rolls through. This tube is accompanied by a chase light row which runs after the ball, however my machine is missing this light row, so you can't see it on the photos. I will install a brand new blue LED light row in the future since some-body in the forum produced some. Note that the original light row was white, not blue! You play for points, so you can practically do whatever you want. However, Xenon was also one of the first machines with multiball, so going for that is the best option. 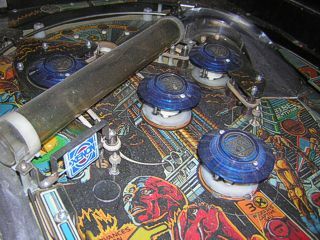 To achieve multiball, you have to hit the kick-out hole (called "saucer" by Bally) above the bumpers three times to light three "X" lamps (visible on the picture of the goddess on the playfield). This enables the tube for ball locking and a second ball will be served to the plunger. Shooting another three "X" lights releases both balls for multiball. The drop target bank on the right awards several values including extra ball and special. As I said above, my Xenon didn't come without problems. The thing is that not only optical, but also technical issues are present at the time of this writing and I want to solve those first before I start touching up. However, it's not as easy as it seemed in the first place. For starters, the left kick-out hole does not work. It reacts towards the ball with a sound but never kicks it out. Measuring the voltage at the coil proved that there was current flowing through it and the coil doesn't look worn or burned, so it's probably a problem with the controls on the power driver board since the coil doesn't react in the tests either. This will have to be tested more thoroughly and maybe some parts have to be replaced. I'm making heavy use of Marvin3m's 1977-1984 Bally Repair Guide for this. The next problem are the displays. All five displays feature either too bright digits (something in the controls is broken and too much voltage flows to these digits), ghosting (you can see an unlit digit being slightly lit next to the normally lit digits) or bleeding (the upper right display has bleeding commas). 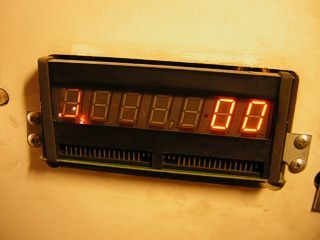 This problem is not only electronic since the displays seem to be worn and starting to outgas, i.e. they won't live much longer and display replacement costs BUCKS. So, the next step is to get rid of the high voltage as quickly as possible so they will display some stuff as long as possible. It might take some replacement of parts here too. All in all the technical side will keep me busy for a while until I can get started with the optical stuff. 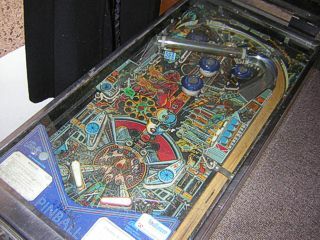 If you look at the playfield, you will agree that this old girl needs some fresh-ness cream in the shape of isopropanol (a lot), lighter fluid (to get rid of the few mylar parts), sanding paper (to hopefully erase some of the crowfeet), lots of new paint and finally a good layer of lacquer so it will all become shiny and be protected for future use. I don't know how long that will take, but it will probably be longer than the technical things. However, since I've tried and succeeded with optical touch-up on The Machine, I'm more looking forward to doing it on Xenon than looking away from the difficulties. After all, this will be a great challenge I can learn a lot from. After this is done, all rubbers will be replaced, the 80% of broken lamps will be removed and new lamps will be added, and then I'll also try to find blue posts instead of the reddish ones that are currently installed. I don't know why it is like this, but I've seen photos of other Xenons with the same issue. The fact remains that blue posts are what Bally intended and the game loses a lot of character without them. The problem here is that the Bally EE posts have another shape than the normal star posts Williams used all the time and replications of these posts are rare just like unused originals. Unfortunately, I know where to get red Bally posts, but blue ones are not offered there... maybe installing blue Williams posts would still be better than nothing and I have seen a photo of this solution where it looked quite good. First I'll buy some testing equipment and solve the problems with the tech. After this, I'll see how much dirt I can get down from the playfield with the tools I have, and then I will buy more stuff to get the restoration started. 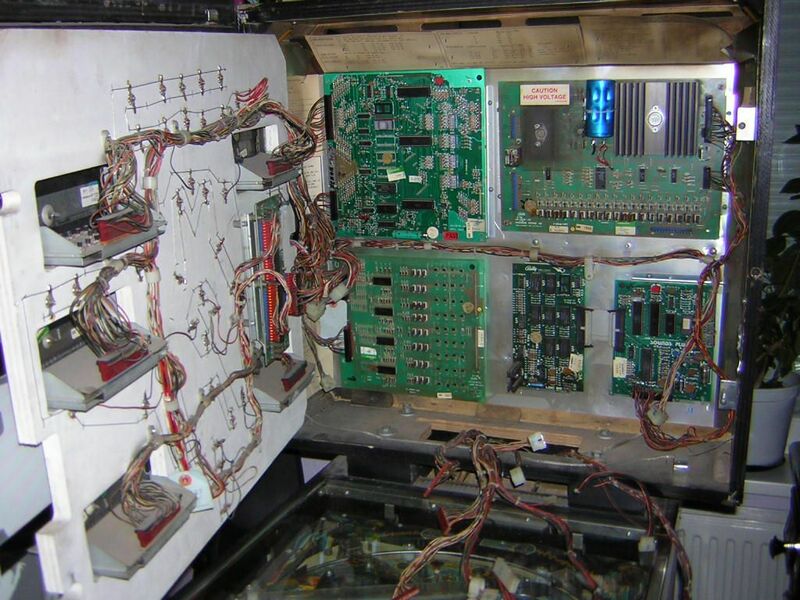 It might not happen all too regularly though since everything you do on a pinball machine takes time, and you know how rare time is these days. Update, 27th March 2005: It seems that I'm running out of luck with my pinball fixing skills - Xenon has been a b*tch with me in the past six weeks and I still cannot figure out what causes the problem with the displays and the non-functioning coils. I have exchanged the solenoid driver board and replaced the acrylic tube with a fresh one plus a new blue LED light strip from www.flipperfrance.com, but even though I tested all of the transistors and circuits that could create problems, I'm finding that I do not have either the patience or the knowledge to diagnose precisely what's happening. 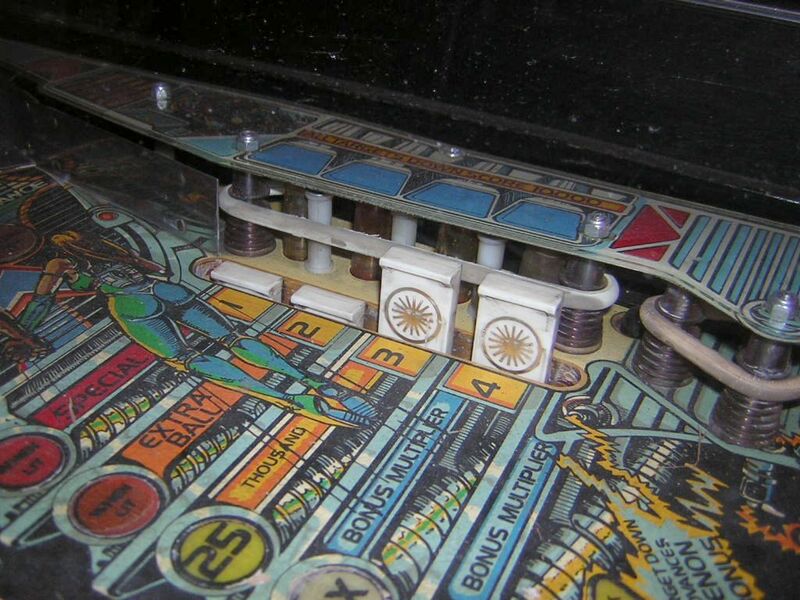 I made great use of Marvin3m's Bally pinball repair guide, but everything I learned from there didn't help me. People in the Pinball Network forum started giving me hints and tips what to do, but this happened after I had made the decision which still stands: Xenon will go and be replaced by a machine I want so much more at the moment and hope to win in another eBay auction, and since I need space and money and Xenon is not giving me much fun at this time (I wanted a machine with a few flaws that are easy to fix) but rather disgusts me more from day to day (it stands around and doesn't work), I have lost all the heart I had for it - that might change later should I see the day when I want a Xenon again in better condition and when the timing is better... after all, my life is turning upside down in this moment and while it seems stupid to sell a machine I wanted so much, I only learn from this experience. The Dutch version of the documentary about the making of Xenon's audio and its then-new chip technology can be found here. The inter-view with Suzanne Ciani was left untranslated, so it's pure English, but the narration is Dutch and a translation can be found on several websites which still offer the QuickTime version of the video. My version is the original, better quality AVI file with MP3 audio. I converted the audio to MP3 because it saves a good 5 MB on my webspace and your download time. The audio did lose a little detail from compression, but it can't be better as MP3 and since it's only spoken language, you'll hardly notice. The AVI video file uses the old Indeo Video 4.4 codec which should be installed on any Windows system, so no additional video codecs are necessary and as long as you have Windows Media Player 7 or higher, you will also be ready for MP3 playback. This is Suzanne Ciani, a componist of electronic music. In a studio crammed with synthesizers, amplifiers, computers and recorders, she does all the compositions herself. Her specialty is making background music for films, but now she faces a new challenge: a manufacturer of pinball machines wants special sounds for their newest game. A double challenge: sounds and voices both have to be integrated. 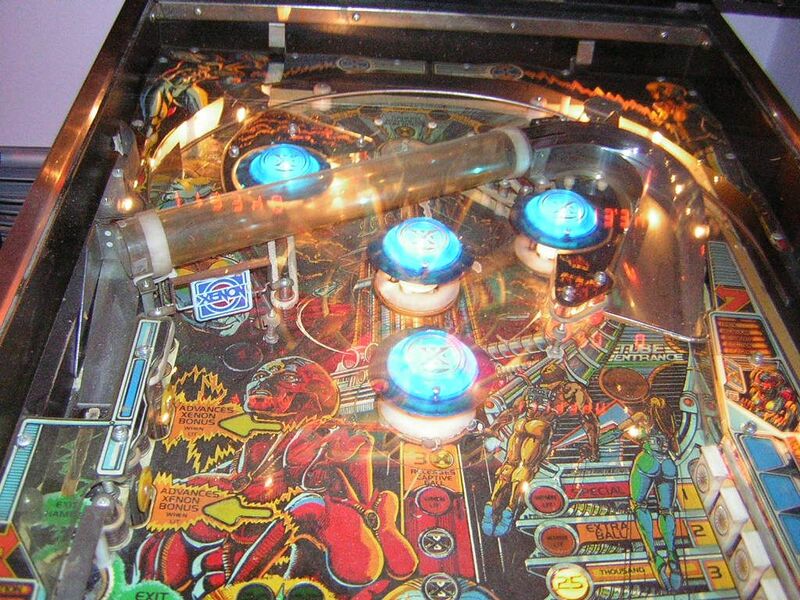 The "pinball symphony" is a new phenomenon, but where do the sounds come from? 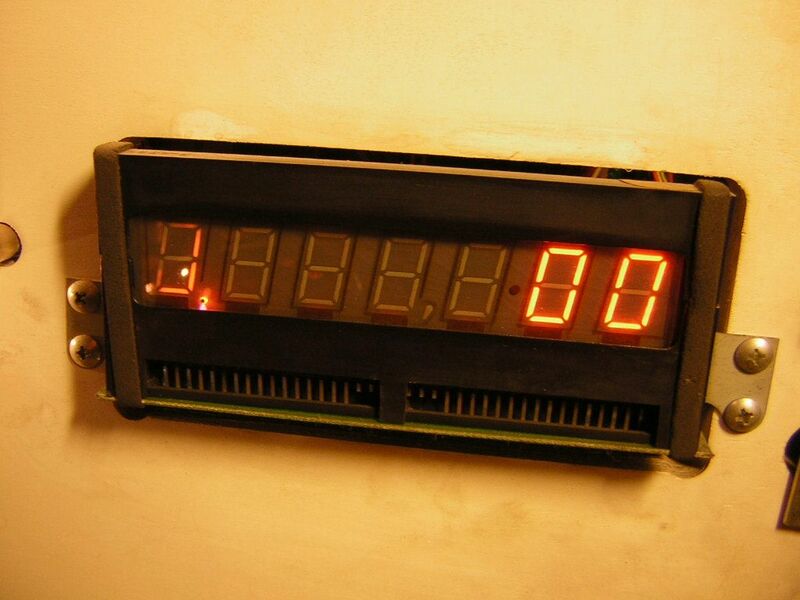 The secret is hidden in a microprocessor: a com-puter as large as a domino. There are 48,000 units of information stored in it. If you connect it to an operating computer, they will be played with the speed of sound. The woman's voice in a pinball. But how does it get into a chip? Besides, women's voices have a higher frequency than male voices and therefore need almost double storage space. This chip gives Suzanne five seconds of speech time. The recorded sounds were analyzed, measured and crunched in order to fit into the chip. Then they were programmed like a computer in a way that they react to the lamps and the scored points. 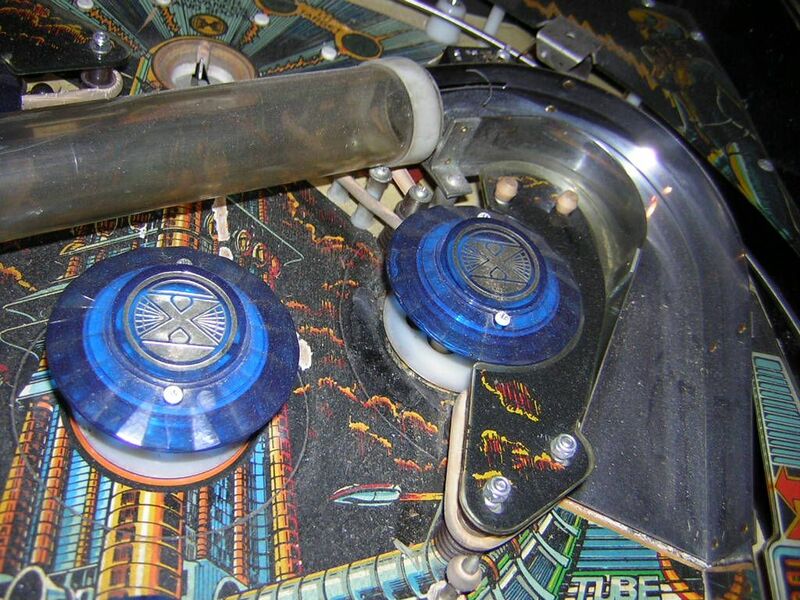 Finally, the chips were mounted in the pinball machine. Sound chips are reasonably new. We will hear Suzanne's voice for five seconds, but maybe in the future we will have sound chips that contain entire symphonies. I don't know who created the original translation, so I cannot credit them. Just be aware this is not my translation but only spelling and grammar editing. If you have VobSub installed for active video subtitling, you can download this file which I created from the above translation, put the file into the same folder as the video, make sure the names of both files are the same (only different extension) and when you open the video, VobSub will automatically read the subs from the file and subtitle the video for you. If you want to read an interview with Suzanne Ciani that was taken by a Ciani & Xenon fan via e-mail, go here. The interview was done not that long ago and thereby reflects upon the year 1980 and beyond from Ciani's today's standpoint. A very nice documentation of a full-blown playfield restoration including decal reprinting and playfield repainting (!) can be found on this page. Note that this is an extreme example of restoration that was conducted by a professional artist. 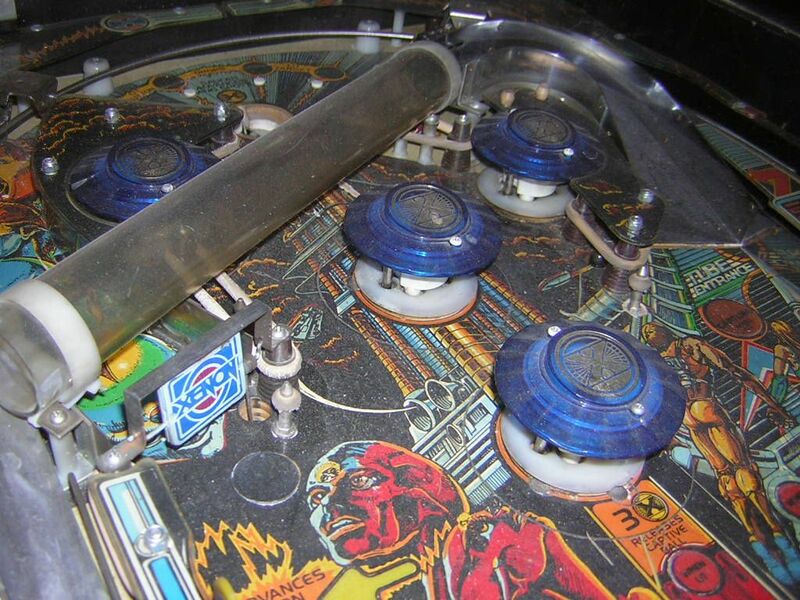 And finally, if you still can't get enough, look at some info and nice pics in the Internet Pinball Database.